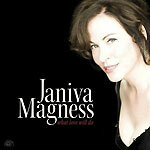 CD review: "What Love Will Do"
L.A. singer Janiva Magness has the sort of blue-collar approach to the blues that Koko Taylor and Angeli Strehli have made hallmarks of their careers. On her first album for Chicago blues label Alligator, Magness brings that street-level world-weary air to her singing  giving the music a gritty charm. Whe's not a songwriter, at least not on this album where all 13 songs are covers. But she shows tremendous taste in choosing songs, with tracks from the pens of Al Green, Ike Turner, Bill Withers and San Diego's own Earl Thomas. She also displays superb taste in interpreting these disparate songwriters, able to dial it back to a slow simmer for Thomas' "I Won't Be Around," finding a funky groove for Withers' "I Don't Want You On My Mind" and rocking out on Turner's "Get It, Get It."